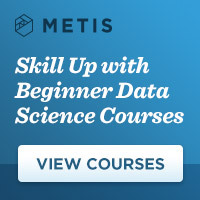 Leading data science training provider, Metis, allows you the flexibility to skill up in data science from anywhere. Learn from industry experts in a unique Live Online format where you’ll interact with instructors and classmates in real time during class. Browse our selection of beginner-level courses and enroll today!